I have been reflecting on which museum would be the next to return antiquities to Italy. Francesco Rutelli has pointed a finger at the Miho Museum in Japan. Most sources are quiet on this lead, but last June there was a hint from the Hecht/True trial in Rome (Kazuki Matsuura, "Witness fingers Japanese museum in Italian art-trafficking case", The Daily Yomiuri (Tokyo), June 4, 2007 [archived]). The expert witness for the prosecution in a trial in Italy over the trafficking of stolen art objects to the United States has claimed a Japanese museum is housing items unearthed illegally in Italy. As the witness named the Miho Museum in Koka, Shiga Prefecture, the Italian prosecutors likely will begin a full-scale investigation into possible trafficking of stolen items into Japan, sources said. some artwork housed in the Miho Museum, including a decorative sculpture of marble from ancient Rome, known as an oscilla, were identified from pictures of stolen items seized from a smuggling syndicate by the prosecutors. I presume the 'pictures' were the Polaroids seized in Geneva. But what about the oscilla? Intriguingly, the Miho Museum has "Two Oscilla with Mythological Figures". They are 34 cm in diameter and made of marble. On one side of tondo A is a standing, bearded satyr wearing an animal's skin tied around his neck and gesturing toward a theater mask that is positioned atop a rocky outcrop. 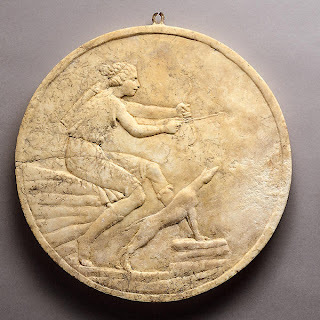 On the reverse, a youthful Artemis wearing a chiton and tall boots sits on a rock and aims her arrow at a target outside the frame. Her hound, at her feet, leans forward, sniffing the air. Tondo B likewise juxtaposes a generic Dionysiac figure shown standing and a specific deity depicted seated on a rock. This time, a fully draped maenad holds a thyrsus with her right hand as she leans against a stepped pillar in front of which a small herm is placed. The other side of the sculpture features a youthful, semidraped Ganymede holding out a bowl to a thirsty and eager Zeus, who has transformed himself into an eagle. The Miho Museum catalogue entry makes the point that parallels for such oscilla are known from "excavations at Pompeii and other Vesuvian sites destroyed in the eruption of A.D. 79". So what is the source for these oscilla in the Miho Museum? Where were they found? Was it Italy? Which dealer sold them to the museum? Or are there other oscilla in the collection? Image from the Miho Museum.